Choosing the right type of glove for handling chemicals is very important. The question is how to make the choice wisely. Glove manufacturers can make recommendations and for certain chemicals the optimum choice is "well known". But what about a new chemical for which there is no advice? A rational way to approach the problem, one that Charles Hansen pioneered decades ago in a research program with the US Coastguard, is to say that diffusion through a glove is driven by concentration gradients, so for a chemical to get through it must, at a minimum, be "soluble" in the outer 1nm of the glove. That sets up the initial concentration gradient and everything else follows. So a good glove material should ensure a low solubility of the given chemical in the outer 1nm of the glove polymer. A rational way to think through solubility is to calculate the HSP Distance between the glove polymer and the chemical. Other things being equal, a larger distance implies greater protection than a smaller distance. Of course, glove selection depends on comfort, cost, convenience in human terms and on properties such as % crystallinity of the glove material which affects diffusion coefficients (higher crystallinity tends to give lower diffusion). And smaller, linear molecules tend to diffuse much faster than large, cyclic or branched molecules. But the HSP Distance should surely be one key criterion for rational choice of glove. If, therefore, there were an authoritative list of HSP values for various gloves and a set of HSP values for challenge chemicals it is possible to carry out a rapid screening for the appropriate glove for a given chemical - keeping in mind, of course, the other considerations. Charles created such a list as part of the US Coastguard project. But that was a long time ago. Fortunately the ProtecPo project now exists to be able to do this rational evaluation. 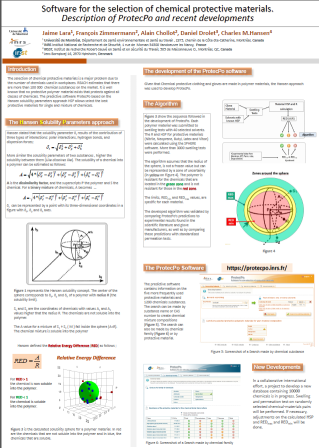 A poster describing the project1 won First Prize at the 6th European Conference on Protective Clothing and we are delighted that Prof Jaime Lara of Université de Montréal has given us permission to provide access to the Prize Winning poster. Users of HSPiP will find chapters in the eBook further describing the science of glove selection via HSP and the science of diffusion is brought to life in the Diffusion section of this website. We have to point out, as does the ProtecPo site, that any safety advice based on HSP Distance selection has to be treated with due caution. As mentioned above, other factors are involved and it is for the user to make a wise choice based on best-available information.